Featuring the special spot of your choice, this custom map tray celebrates the cartography of your life. Whether it's your favorite vacation destination or the spot where you met your soul mate, this custom map tray celebrates the cartography of your life. Crafted from mango wood, it features a laminate top displaying three square miles around your address of choice, including streets, landscape features, and a star to mark your special spot. Complete with a personalized legend and table-protecting pads, it makes a distinctive hostess or housewarming gift. Made in Providence, Rhode Island. These maps are reproduced from the kind you can now find in quaint vintage shops. That means they show the beauty of the topography and most streets and landmarks, but you might not see your favorite new cafe. 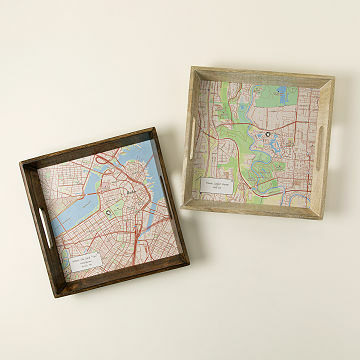 Pair your Custom Map Serving Tray with our Custom Map Coaster Set. Lovely and practical. Photo/map is older, but that makes it special. The tray is a true original and can be used for display or serving platter. Great conversation piece and so thoughtful. Dissapointed. I thought the map would have more detail. Nice tray, but was not impressed with map. This is a nice tray. It is great for parties, guests can look for their locations .. It is a terrific house warming gift. In addition to the pluses for the map clever idea, it is also a really nice tray. We bought it for a gift. In the key on the map you can put an address or map coordinates. In addition to that you can also put a message. Ha, if you own this tray and lend it to someone, they have no excuse for not returning it as it has your address right on the tray!! This was a perfect gift. This is eye catching enough to be used as part of your home decor and functional at the same time! Both my niece and I both like to entertain friends and family. We have both used our more than once. We also love it sitting around as a conversation piece.